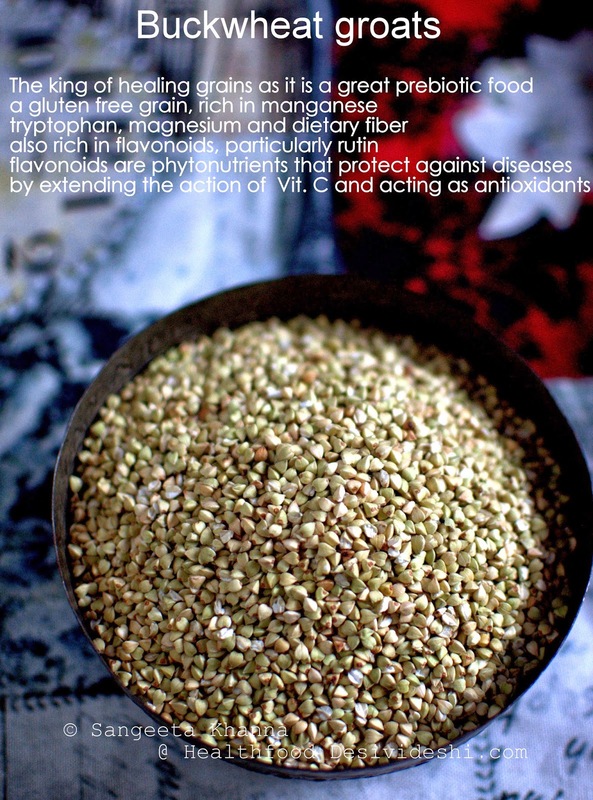 Buckwheat is called as the king of healing foods, a gluten free grain that has a fantastic nutrient profile. I use buckwheat a lot for soups, like this tomato buckwheat soup, a spinach buckwheat soup, sweet breakfast pancakes with buckwheat, savoury pancakes with buckwheat and even a buckwheat khichdi. It is such a versatile seed you can use it for almost anything, I made an English muffin with buckwheat and that has been a favorite alternative flours bread till date. A buckwheat base pizza is a recent favourite. Read health benefits of buckwheat in detail here. 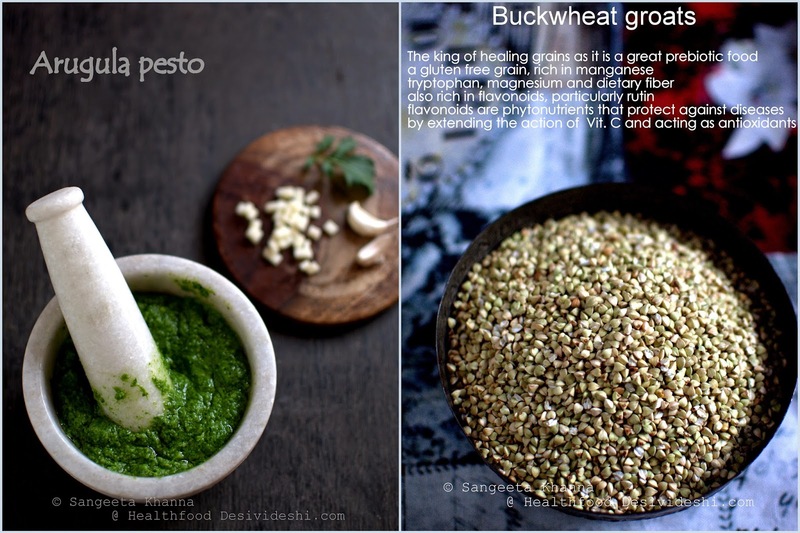 Buckwheat is a preferred grain for Navratri fasting as well and I thought of sharing these two recipe with you so it would be useful for those who are fasting and looking for variations for fasting food recipes. These recipes are not fasting recipes as I have served one of these with eggs and used onion and garlic, but one can always cook them without any onion garlic and make it suitable for fasting days. Buckwheat salad with rocket (arugula) pesto and stir fried bell peppers.. 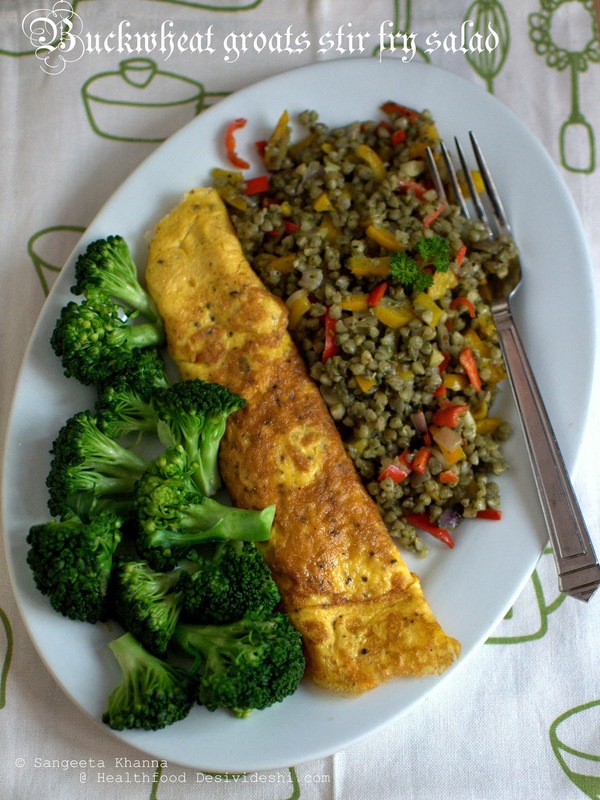 This is a quick meal if you have some soaked buckwheat groats in the fridge. Or just soak them for a couple of hours and cook them just like plain rice. I usually microwave them with the soaking water and a few drops of ghee or olive oil for 3-4 minutes (for 1/2 cup raw buckwheat soaked with a cup of water) and it is ready to be used just like any small pasta (like orzo). I had made a nice pesto using fresh rocket from the garden and it tasted really good with cooked buckwheat groats. The thinly sliced bell peppers provided a much needed crunch and a peppy twist to it. This salad can be tossed up with green peas, green beans, mushrooms or even some boiled chickpeas. The pesto recipe is the usual garlic, rocket leaves, parmesan cheese and cahsew nuts along with extra virgin olive oil. I used cashew nuts to cut the sharpness of rocket leaves as they had become quite peppery after flowering. Detailed recipe will be posted soon. Add 1 tbsp of pesto to 1/3 cup of cooked buckwheat, mix well and keep aside. Heat the ghee or oil in a pan and tip in the garlic and chopped bell peppers together along with salt and pepper and flash fry for a few seconds. Take them off the flame, add the mixed herbs, toss well and add the pesto smeared cooked buckwheat groats. Mix well and serve right away. I served a plain omelet and some steamed broccoli with this salad meal. We both loved the way it satisfied our taste buds as well as filled our tummy. The other version of stir fry salad with buckwheat groats is a very different bouquet of flavours. I used a lot of ginger in this cabbage and green peas stir fry with paneer cubes and mixed with cooked buckwheat groats. Then the ingredients were mixed together and tossed with tasted sesame. This was so yummy I had to make the same version again the very next day. 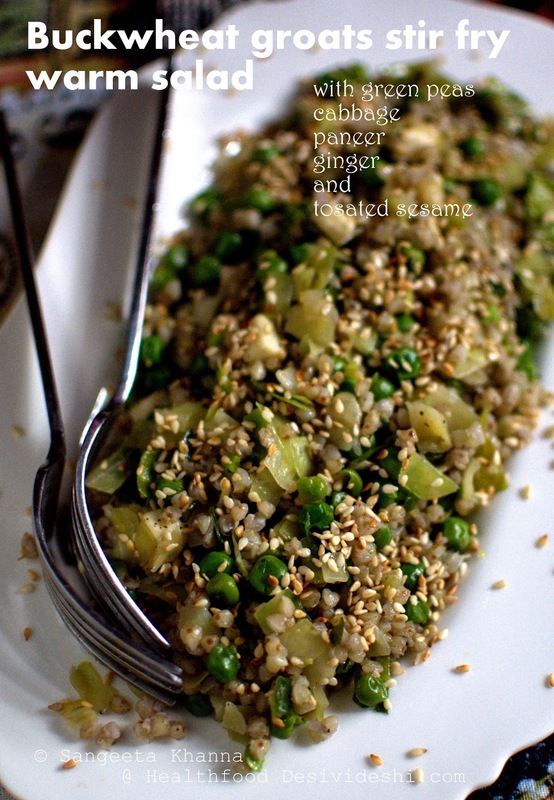 We both love toasted sesame and green peas and ginger, the other flavours just came together nicely. A nice cabbage stir fry was made first. This is something I love wrapping in a multigrian roti sometimes or stuffing in a whole wheat or ragi bread sandwich. 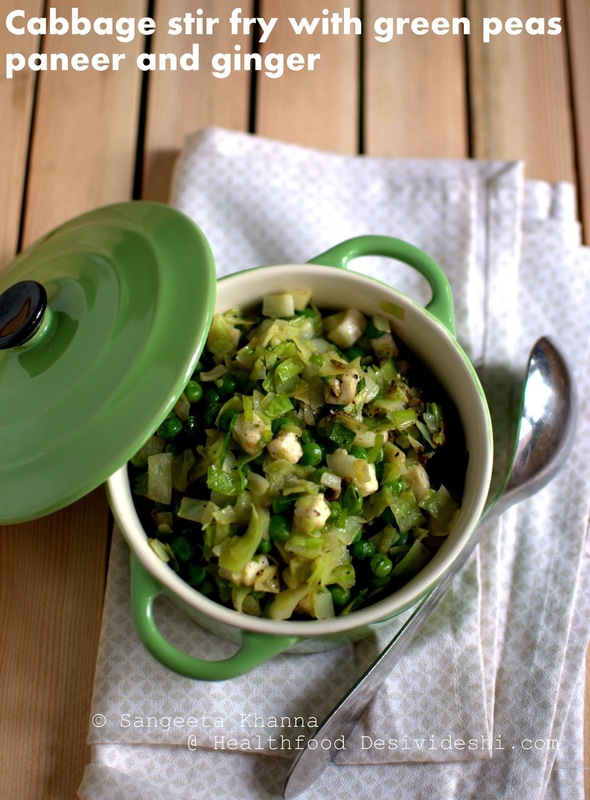 And sometimes I just have this cabbage and peas as a meal either with added potatoes or paneer. Heat ghee along with 1 tsp cumin seeds and tip in a cup of green peas along with 2 tbsp minced ginger. Add slat and pepper to taste, cover and let the peas cook for 3-4 minutes. Add 2 cups of chopped cabbage, mix well and cover and cook for 3-4 minutes more. Add 1/2 cup of cubed paneer and stir fry the cabbage mix for a couple of minutes. 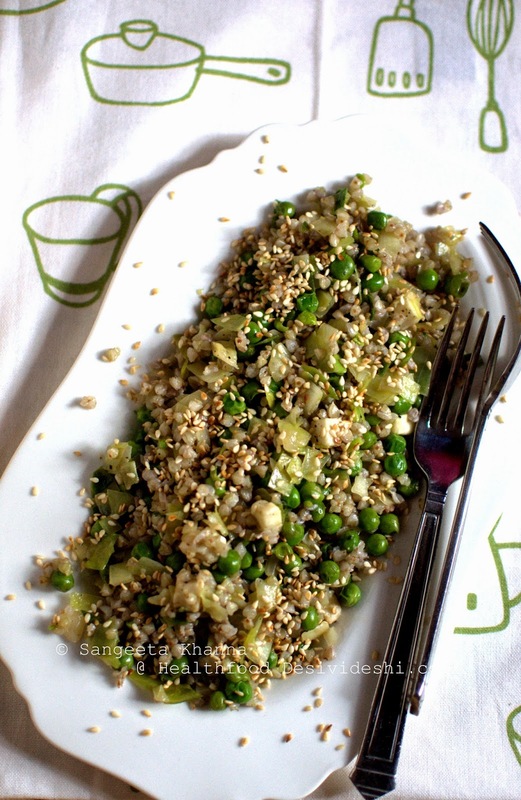 Mix the cooked buckwheat groats with the cabbage stir fry while it is still warm. Serve it in a platter and sprinkle sesame seeds generously over it. Enjoy as it is or with a mint and onion or pineapple raita. seriously sangeeta, didn't know that buckwheat is called kutto, i pass through a whole aisle stocked with these in our indian supermarket here and never knew the magic of this grain. next time i buying some to try this cabbage stir -fry. Love the cabbage -paneer version!!! 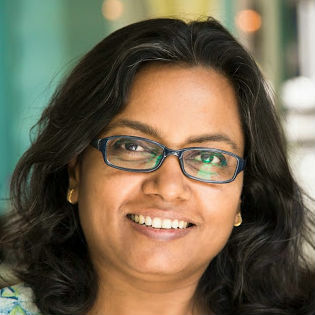 Hi Sangeeta, please let me know under what brand name kuttu groats are available. In bangalore, i have only seen it as Kuttu ka atta in few stores but havent spotted the groats yet. 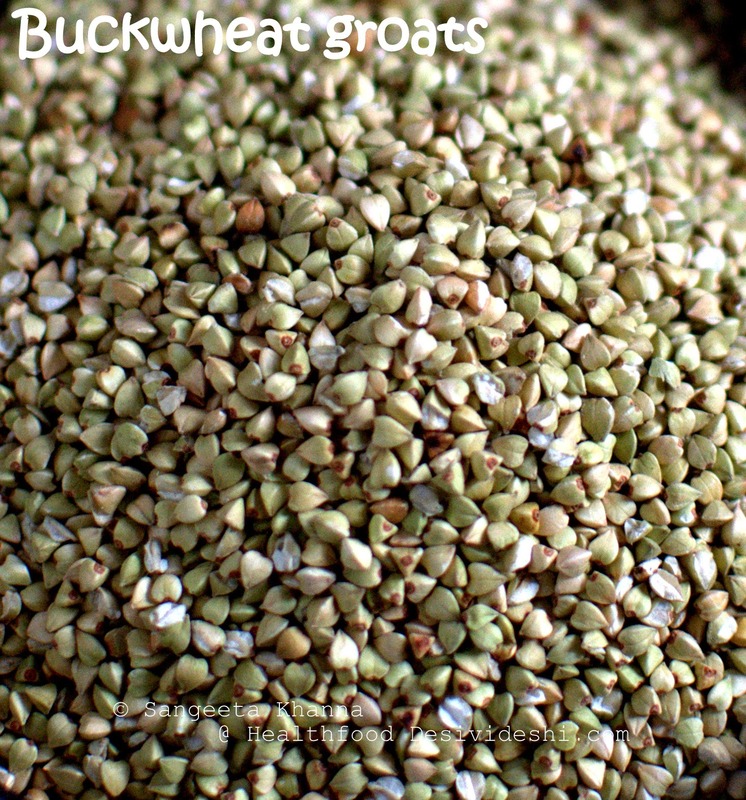 Hi, Have you been able to find buckwheat groats anywhere? Kuttu groats are available in big bazar outlets too. I tried the Big Bazar in Yeshwanthpur, but could not find. Can you tell me , which outlet you know we can get Buckwheat. I need this for my research. If you can direct me to a store that will be great. Thanks. Mail me at sangeetaamkhanna@gmail.com. I can send you some if you wish. I normally buy mine whole from Down to Earth website and grind as required. I have seen the kuttu groats in Delhi big bazar outlets a few times.